Best Single Serve Coffee Maker – Top Picks and Reviews 2017! Single serve machines are rightly termed as the “busy man’s” coffee machine. They combine easy operation and convenience to create a complete package. But with so many machines, buying the one that meets your need may feel like an overwhelming process. Already have a coffee maker that you are satisfied with? Check out Freshpresso’s coffee grinder reviews to up your coffee game to the next level! Keurig K250 – Equipped with the most advanced brewing technology among single serve coffee machines, the K250 has optimized brewing process for different beverages. Gives YOU the power to brew a ‘stronger’ Cup and has the largest brew size of 30 oz. 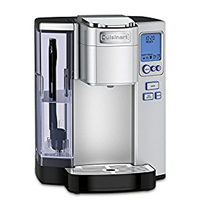 Cuisinart SS-10 – Need multiple cups of coffee at once, well then you need a bigger reservoir. With a 72 oz. Water talk, the SS-10 does that, and advanced features like auto brew give it an edge in convenience. Can brew bigger sizes up to 30 oz. Through bigger coffee pods, known as K-Carafes. Gives the option to brew a stronger coffee compared to other machines. Can choose from tons of flavors from over 500 brands. Optimized brewing for different drinks like hot chocolate or tea. Ground Coffee can also be brewed. Simple one touches operation with an intuitive touchscreen. Doesn’t support third party K-cups. (Only supports “Brewed by Keurig” K-cups. The water reservoir is on the smaller side with 40 oz. capacity. 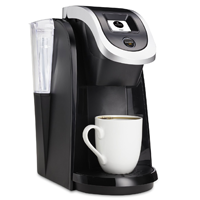 The K250 is part of Keurig’s refined line i.e. 2.0 series. 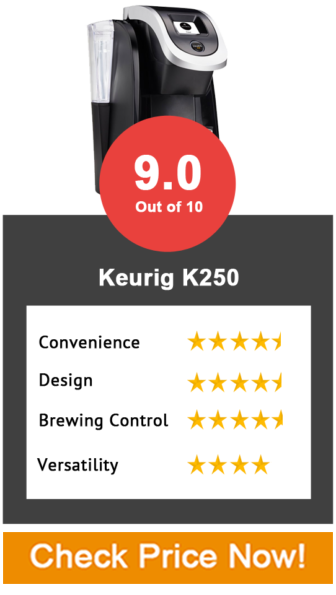 The 2.0 series combines improved brewing technology and greater user control. The machine now optimizes the brewing according to different beverages and-and also gives the user to control things like strength and temperature. The K250 features an intuitive touch screen where the user can select the size, the beverage type, and the strength. The process, however, remains, the same. Simply pop in the K-cup, select the size and hit the brew button. You get three different types of pods now. With the K-cup pod, you can brew regular sizes from 4 to 10 oz., with the K-Mug pods you can brew from 12 to 16 oz. And with the K-carafe packs, you can brew up to 30 oz. All the three pods have a special mark (or barcode) on the lid which is recognized by the machine, and the brewing is optimized according to it. With the K250 the temperature is set at 192° F for K-cups and 197° F for K-mugs and K-Carafes. With high-end models like the K450 and K575, you get the option to change the brew temperature, but there is no major effect on the taste. A major complaint that people had with the Keurig Machines is that the coffee brewed is not that strong. That has been addressed in the Keurig 2.0 line. In the K250 there is a “strong” option on the screen which can be selected if you want a stronger brew. (Freshpresso will recommend you to keep this selected unless you are using coffee grounds). However, the advanced brewing technology is what sets the K250 apart from other one serve coffee machines. Since the machine scans the pod, it automatically optimizes the process according to it. So if you are making hot chocolate or tea, then there is an automatic change in brewing. Users can also select the “hot chocolate/other” button on the touchscreen when they are brewing something other than tea. Well, what does this do? Thanks to this feature, the taste of other beverages like hot chocolate or tea or even ice drinks, is comparatively better than other machines. Finally, you can dispense hot water with the K250. Overall, it leads in areas of flexibility and capability in single serve machines. Keurig has recently introduced my K-cup 2.0 with which you can use ground coffee. You can change the strength through when using ground coffee, but we will not recommend doing so unless you are a fan of “super strong” coffee. As of now, y k-cup 2.0 supports sizes up to 12 oz. Reusable filter pods have not been introduced for Carafe sizes. As soon as they are available, we will update about that on Freshpresso. Apart from the 500 brands that were related to Keurig, there were many brands who used to manufacture coffee pods for Keurig machines, at a lower price. But now since the machine scans the special barcode, only pods that are “brewed for Keurig” can be accepted. The Older type of K-cups is also not supported in the K250. This makes the machine somewhat restrictive. Secondly, the K250 comes with a 34 oz. reservoir. With that, you can brew a full capacity carafe and 2-3 normal sized cups. After that, you would have to refill the reservoir. Higher end models like the K475 and the K575 have bigger 70 oz. and 80 oz. reservoir. So if you need more capacity, you can go for that. (However, the K575 adds little value to the machine apart from the reservoir). Overall, the Keurig K250 hits all the checkpoints for a premium single serve machine. It is easy to operate, brews good coffee (and gives the user control over the strength), highly versatile and continues to perform for years. If you are a heavy drinker and love to have coffee 2-3 times a day, then K250 would be a perfect choice. 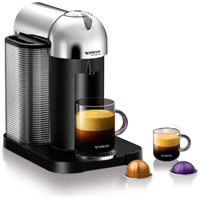 The latest and greatest by Nespresso is there VertuoLine Evoluo Machines. These machines use patented Centrifusion technology with which you can brew both espresso and regular coffee, through a single serving coffee machine. Can brew regular coffee blends and espresso on a single machine. (Espresso Brewed has a beautifully separated layer of crema). Large 54 oz. Reservoir ensures that you don’t need constant refills. They are several flavors and roasts available for the espresso, and you can also choose from hundreds of blends for regular coffee. The Evoluo Deluxe scans the capsules, and brewing is adjusted according to that. For espresso, water is heated to a higher temperature and added pressure is applied for a better espresso extraction. For normal coffee, different brewing setting is used (according to the blend). To add to that, Centrifusion technology is used which pre-wets the grounds before extraction. All of this is completely automated, and you don’t have to worry about a thing. You simply pop in the capsule inside the brew head and hit the brew button. It takes about 15 seconds for the machine to get heated up (which is extremely fast) and you get a cup of coffee in under a minute. Overall, the Nespresso Evoluo Deluxe acts as your personal barista that understands different coffee types and adjusts the brew accordingly. 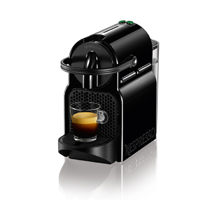 (Concerning taste it is at part with the Keurig K250, but the Nespresso Evoluo can brew espresso also). You can froth milk using the Aeroccino Plus. It is a carafe like machine which rests on a base and froths both hot and cold milk. There are two markings inside the carafe. You need to fill the milk till the lower one if you simply want to heat it, but for more foam, you have to fill the milk till the upper marking. Since a lot of foam is generated, we recommend you to fill the milk below the mark to avoid inconsistent foam. Secondly, fat-free milk is also recommended for better foam. For hot frothing, you simply have to press the button on the Aeroccino Plus, and when the light turns red, it begins to heat and froth the milk. For cold frothing, you have to press the button for two to three seconds, till the light turns red. The froth generated is consistent and lacks bubbles and can be poured into the cup. After that, you can brew your regular espresso on the Evoluo Deluxe Coffee Machine. It takes about a minute in both cases for the froth to be ready. With the Aeroccino Plus you can conveniently make many milk based drinks, and with the revolutionary cold frothing, iced coffee drinks can also be brewed. Compared to home espresso machines, which use a wand for frothing, the Aeroccino Plus is an excellent choice if you want to make café style drinks without any hassle. Cleaning the Nespresso Evoluo is quite convenient. First off, the used coffee capsules are collected in a separate container. It can hold 17 used capsules before you have to clean it. To rinse the machine of any leftover coffee simply hit the brew button without placing a capsule. It takes about two to three minutes for the rinsing process to be completed. The Aeroccino Plus is dishwasher safe and should be cleaned regularly. The heating element inside the Evoluo Deluxe isn’t that powerful. Due to this, the coffee brewed has an inconsistent temperature. This isn’t a deal breaker, but if you like your coffee super hot, then this isn’t for you. Secondly, after regular use, the foam generated gets somewhat inconsistent. You would have to replace the wire whisk that goes inside the Aeroccino Plus. 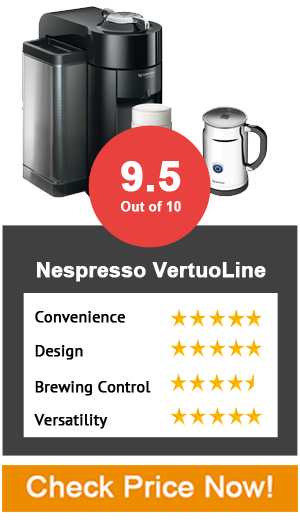 If you regularly go to Starbucks or your local coffee shop to enjoy a cup of cappuccino or latte, then the Nespresso VertuoLine Evoluo coffee maker saves you a fortune in the long run. With no experience (and skill) you can brew delicious coffee within a minute or two. You can also choose from hundreds of blends and experiment with multiple flavors. It is truly a versatile machine that is convenient to use and brews delicious coffee. If you want cappuccinos and lattes but don’t want to spend a lot, then you can choose Nespresso Pixie with Aeroccino Plus. It however only brews espresso and is somewhat of a restrictive machine. Another budget friendly choice for single serve latte machine is the Mr. Coffee BVMC-EL1. A delicious coffee with the simple one-touch operation and no hassles is what we expect from single serve machines, right? Well, Keurig K55 does that flawlessly. The “Keurig Trust” is backed up with delicious coffee and smooth operation. Here is the why you should get a Keurig K55. Simple one touch operation makes brewing super easy. Consistent brewing temperature and operation even after years of brewing. You can use your ground coffee or decaf through My K-cup, supported by the K55. You can choose from tons of flavors from the leading K-cup brands. Three brew sizes – 6, 8 and 10 oz. Descaling takes time (but if you install a water filter in the reservoir, you need to descale once or twice every four months). If you are not a regular coffee drinker, you have to regularly clean the tank to avoid any contamination. Brewing a cup of coffee on the Keurig K55 is super easy. Simply lift the brew head, pop in your K-cup and hit the brew button. You can brew three different sizes i.e. 6, 8 and 10 oz. While the 6 and 8 oz. coffee tastes perfect, the 10 oz. Coffee is on the lighter side. This also depends on the kind of flavor you are brewing. The whole brewing process takes under a minute, which is quite impressive, and secondly since the Keurig K55 is powered by Quiet Brew Technology, the machine isn’t that loud. The drip tray is removable, which makes it possible to accommodate a travel mug. The Keurig Stainless Steel Travel Mug is suited for this, as it keeps the beverage warm for a period extending four hours. Like other Keurig coffee makers’ flexibility is at the forefront. You can choose from tons of flavors and even experiment with different kinds of drinks. Apart from coffee, you can also brew tea and hot cocoa with the K55, all you need is a K-cup suited for that particular beverage, and you are good to go. The Keurig K55 is compatible with third party K-cups too. You can also brew cold drinks with the K55. For that, you get K-cups with a blue sticker on them. Simply place a cup with lots of ice in it, add the K-cup in the brew head and select the size. For colder beverages it is recommended to select the smallest size, to make sure that flavor doesn’t get diluted with ice. If you are a fan of a particular gourmet ground coffee or need some decaf coffee at night, then the Keurig K55 supports that too. All you need is a My K-cup in which you can add the ground coffee. The brewing process remains the same. There is no major difference in taste but is recommended to buy it is recommended to buy gourmet coffee grounds (like Arabica coffee) for best results. Cleaning the Keurig K55 is not big of a hassle, but descaling takes some time. If you want to increase the period between descaling, it is recommended to install a filter in the reservoir. The Keurig Descaling Solution is recommended for best results. Secondly, the 40 oz. Reservoir can prove to be too big if you are not a heavy drinker. If you brew one or two cups of coffee, it is recommended to fill the reservoir, to only half of its capacity. Also, clean the reservoir frequently to avoid contamination. There is nothing majorly wrong with the K55 but it is best to keep the aforementioned points in mind before you buy this. 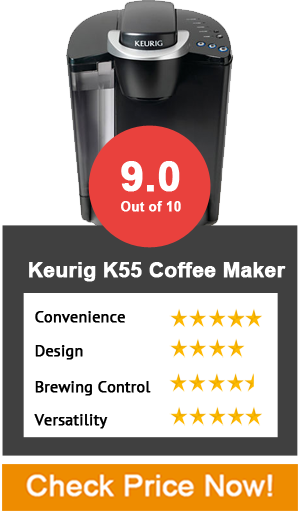 Overall, the Keurig K55 stands out in every single department. If you are not a heavy drinker and want delicious coffee, this is easily most convenient coffee maker in the market today. But if you are a fan of espresso or need greater brewing control, you can go for the Nespresso Innisia or the Keurig K250. Simple one touch operation, with programmable buttons for espresso or lungo. With a compact footprint, it is perfect for smaller kitchens. Cleaning is hassle free and doesn’t take much time. You can choose from different flavors. You are restricted to espressos and cannot make regular coffee or other beverages with this. 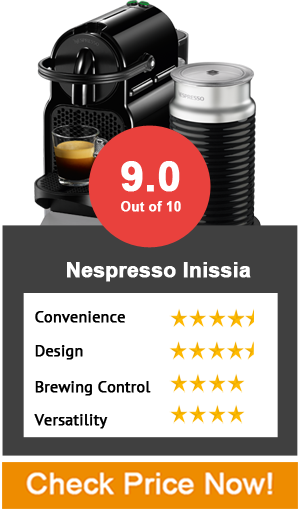 We love the espresso brewed by the Inissia especially considering its price. It gives high-end espresso machines like the Gaggia Brera a run for its money. The espresso brewed is flavorful and to top that off it has a nice consistent layer of crema. This is achieved by a powerful heating element which gives 19 bars of pressure for the perfect extraction. Secondly, the espresso extracted has a temperature of around 180 degrees Fahrenheit, which is the same as high-end espresso machines. The operation is again super simple; you simply have to lift the brew head, insert your capsule and hit the button. It offers two default sizes the espresso and the lungo. But they are programmable so if you want a custom volume of espresso, then simply hold the button, till the desired volume has been pulled. The Inissia remembers this volume setting for future brews. However, if you are on a budget, then Nespresso branded capsules are on the expensive side. You can buy third-party capsules like Rosso Caffe, which are comparatively cheaper and there is no drastic difference in taste. Cleaning the Inissia is a breeze. The used capsules are collected in a small container. For a smooth operation, it is recommended to clean the reservoir and the container weekly. You can also install a filter in the water tank, for minimal scaling. With an Inissia, you can only brew Espressos (and Americano by adding hot water). But if you are the fan of regular coffee then this isn’t for you. Also, it gives no control to the user over the brewing process, but then single serve machines are designed for convenience and one-touch operation. If you still require some control, then check out the Keurig K250, which offers a change in brewing temperature and altitude settings. If you are the fan of the ‘morning jolt’ then Inissia is the best single serve espresso machine on a budget. We have no complaints with the quality of espresso, and in the long run, it saves you a fortune if you have a habit of going to coffee shops. The large 72 oz. Reservoir avoids the hassle of multiple refills. Can be programmed to brew a cup at a set time. Comes with rinse functionally to get rid of any leftover coffee from the previous brew. Coffee tends to splash when it is being poured into the cup. It looks good, but the buttons and the exterior construction gives a cheap feel. Nosier compared to other single serves. The operation is the same as other single serve machines on our list. Pop in the K-cup, select the size and hit the brew button. 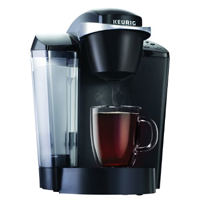 Unlike the Keurig K250, it cannot brew K-Mug and K-carafe pods, and the maximum brew size is 12 oz. The larger water tank, however, ensures that you won’t have to refill it often. This can come in handy if you have a large family or if there is a constant need for 5-8 cups at a point of time. You can brew flavored beverages and other beverages like tea with the SS-10. You can also brew your ground coffee with the reusable filter. (And btw you can store the reusable cup, in a small compartment attached to the machine). But the machine gets heated up quicker than any other Keurig Machine. (So Cuisinart scores a big point there). What can the User Control? One of our favorite features of the Cuisinart SS-10 is the ability to brew a cup of coffee at a set time. You can set the time using the Menu option, and leave the K-cup inside the brew head. If you need that “caffeine rush” in the morning, you’ll love this feature. And yes, if you are brewing two different flavors one after the other, it is recommended to use the “rinse” functionality so that there is no leftover taste of the previous brew. Cleaning the Cuisinart SS-10 comes with some quirks. First of all, few coffee grounds are left behind in the brew head after each brew. An obvious solution to this is to use the rinse button, but that results in wastage of water after every brew. 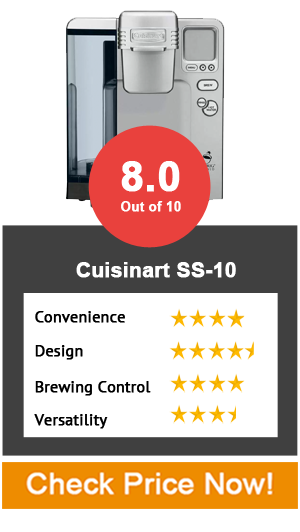 Finally, compared to other single serve machines in our list the Cuisinart SS-10 is a bit louder. Overall, the SS-10 is recommended if you want a bigger reservoir and love the feature of the auto brew. However, if you want a flexible machine (without any compromise in regards of convenience), then the Keurig K250 does a better job. The BVMC – EL1 is a sort of a middle ground between single serve and drip style coffee machines. If you are looking to brew lattes on a budget, then this is a good option. Can brew multiple cups at one go. Can brew other beverages like hot chocolate. Budget friendly and saves you the additional cost of buying coffee pods or capsules. Fairly slow, takes about a minute to brew. To brew latte on the BVMC EL-1 simply add ground coffee at the top and add water to the reservoir. Attach the milk frother to the machine and hit the brew button. It uses drip style filter, and the whole process takes about 5 minutes. The full capacity of the milk frother is 24 oz. Due to a bigger size, you can brew several cups at one go. You can also brew iced lattes or hot chocolate on this. It comes with a recipe booklet which can be used to brew different styles of drinks. Overall, if time is not a big issue, and you want decent lattes at a budget then, the BVMC-EL1 is recommended. First of all, it takes about 5 minutes to brew. It is the slowest of all the machines on our list. Secondly, since the heating element is not that strong, the coffee brewed is about 150 degrees Fahrenheit. This is significantly less than other single serve coffee machines. 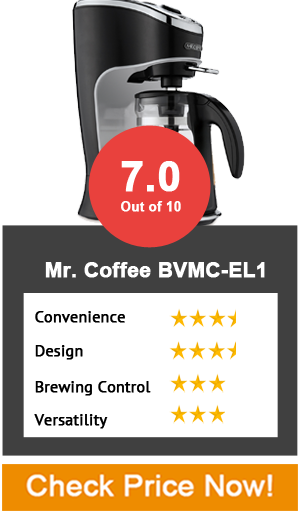 Overall, the Mr. Coffee BVMC EL1 can brew decent lattes, but the overall quality isn’t that great. We will recommend this only if you are on a tight budget. You can invest in better machines like the Keurig K55 and Nespresso Inissia for just a few bucks more, but they offer greater versatility and function, compared to the Mr. Coffee BVMC.